Yes... I know that I was scheduled to preach three weeks ago, in fact I had a very good idea for this homily but... Archbishop O'Brien decided to preempt me with a recorded Lenten message. So I guess I will have to wait for 3 years to get a chance to use my idea. Anyway, here is my homily for the 2 Sunday of Lent. 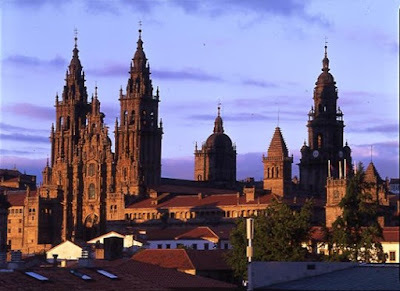 For the last 1200 years, the city of Santiago de Compostella in northern Spain, has witnessed one of the oldest traditions in the Catholic Church. Throughout all of this time millions of pilgrims from all over Europe have walked hundreds of miles, to visit the shrine were it is said the Apostle James is buried. You can imagine that in more than a thousand years of history, many legends and traditions have developed in this road. One peculiar place on the road to the shrine of Santiago de Compostella is a mountain pilgrims have christened “El Monte del Gozo” or the mount of joys. Interestingly enough, noting significant ever happened in this hill. Its importance comes from the fact that this is the very first spot in the road from which on a clear day pilgrims which have spend weeks walking, can catch, for the first time a glimpse of the City of Santiago and of the shrine which houses the apostle James. “Ultreya e suseya!” is a call of hope and encouragement among pilgrims on the road which literarily means “Press on! Don’t give up!”, and it is said that this call is never more urgent than when claiming the mount of joys. I bring this up today because like those millions of people that have visited the apostle James, we are all pilgrims. Every man, woman and child in this sanctuary, is in their own personal journey. But unlike the road to Santiago our road is not marked by quaint monuments, not even by the steps of those before us. You can say that our road is just a path on the sand, because we do not walk a road but we wander in a desert. And this is never more evident than during this time of lent, a time in which, by wearing ashes, by fasting, by making sacrifices we show the world that as followers of Jesus we do not wander alone. In this season, we give up comforts, small things like coffee in the morning or our favorite TV shows. Some of us even make an effort to serve others during this time, perhaps in a soup kitchen or visiting the sick. We do these things not because of some superstitious fear of the fires of hell, like many people like to believe, but because we recognize ourselves as pilgrims, members of the body of Christ that along with the apostles, in these 40 days, we walk with our Lord in his way to the Cross. So on this time of penance and sacrifices today’s Gospel… Today’s gospel is a breath of fresh air in a long dusty road. Because, today Jesus takes us to a place where we can rest and catch a glimpse of the end of our road. In the transfiguration Jesus takes us to visit our own Mount of Joys. He reveals to us like as he really is, in all of His glory, a resurrected Lord friend of mighty prophets and simple fishermen, in a perfect relationship with The Father, which calls him “beloved” and invite us to listen to the words of His Son. But we should not make the mistake the apostles made, where they though they could stay in this mountain forever. We should not forget my brothers and sisters that our journey is not over yet. This is just a stop on the road, a point for rest and get encouraged. Yes, Easter is waiting but between here and there, there is another mountain we all must travel with a cross, a crown and three nails, and in the pilgrimage of our lives we encounter this mountain many times. Perhaps even today some of us are been visited by the pain of sickness, or the sorrow of losing a loved one. Perhaps we are experiencing fear and uncertainty because of what is going on in the world today. Transfiguration Mountain reminds us that the road doesn’t end with pain, sorrow and fear. Beyond the Cross lies the empty tomb. So this 2nd Sunday of lent is a well deserved stop on a long road, a moment to visit for a short time with our resurrected lord. This is a day to gather all of our energies so we can go on with the pilgrimage of our lives, so the next time we find ourselves tired and discouraged… we can all return to this mountain of wanders, to this mount of all joys, and perhaps when we need it most we will hear the words of our God as he tells us: “Ultreya e Suseya!” Don’t give up, press on! The Glory of Eastern is waiting beyond the cross!